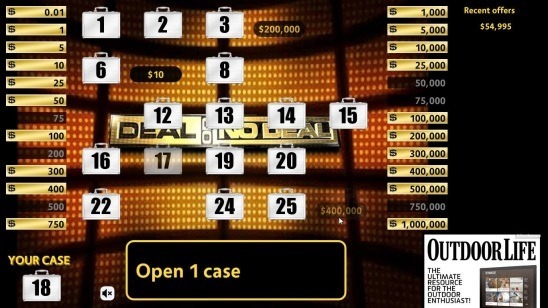 Deal Or No Deal+ is a free Windows 8 Deal Or No Deal game app. 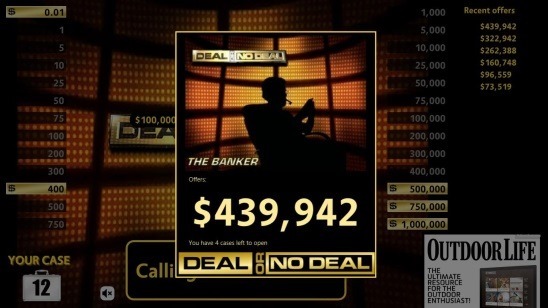 Using this game app, you can now play the popular TV game show with the same name “DEAL OR NO DEAL”, on your Windows 8 PC. This game is played with 26 cases (briefcases) containing certain amounts of money. Initially, the player chooses one of the case as his own case, without knowing the amount, and then chooses remaining cases one by one to remove them off the gameplay. The game consists of several rounds or waves. After each wave, the player is offered certain amount of money by the banker in exchange of his own case and asked to quit the game. Now it is up to the player to stay in the game or not, by choosing deal or no-deal! This free Windows 8 Deal or No deal game app is present under the Games Category in Windows Store. You can also use the Windows 8 Search Charm to find the app is Windows Store (or use the link given at the end). Like said before, the gameplay is totally based on the DEAL OR NO DEAL TV game show. Therefore the game is played the same way as it is played in the TV show. You’ll have a total of 26 cases initially. The contents of the cases, that is the Cash values, are known beforehand, and are shown at the left and right side on the screen. It ranges from $0.01 to $1,000,000. But the exact location of the prizes(cash) are unknown, as the cases are closed. You have to choose any one of the cases to start the game, but the prize money will not be revealed until the game ends. Once you choose the initial case, you can proceed by choosing more cases which will be removed from the gameplay. And like the original TV show, the amount inside the removed cases gets revealed. The money is revealed in an interesting animation wherein the case gets faded out revealing the cash amount. This effect looks pretty cool. There are total 11 rounds in the game. After choosing the initial case, you will be left with 25 cases. Now in each round, you will have to remove certain cases, starting with 6. That means, 6 cases in first round, 5 cases in second round, 4 cases in 3rd round, and so on. In the trailing rounds, you will have to remove the cases one by one. At the end of each round, you will get a call from the banker and he will offer you some amount of money that you can take and quit the game. This amount could be more or less than the amount in your case. Considering all the remaining cases (and of course the amounts left in the gameplay), if you feel this is the right time to quit the game then, you have to choose Deal, else choose No Deal. That is pretty much about the gameplay. 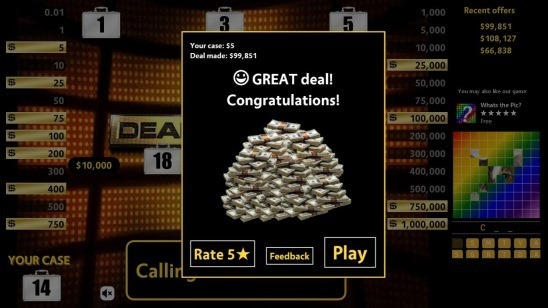 The graphics of this Windows 8 Deal or No deal game app are pretty nice. I liked the cases fading effect. One good thing about the app is that it gives you proper instructions throughout the gameplay to make it feel as if a real game host is communicating. This Windows 8 deal or no deal app is very intuitive. Every dialog and interaction boxes are natural and pops up with nice effects. Plus the sound effects are pretty nice, for example the sound the audiences make when you open a large case makes you feel great. The game is pretty straight and simple. There’s no trivia or stunts, all you have to do is click! Follows a screenshot of a great deal within the game app. Good Windows 8 Deal Or No Deal game app. 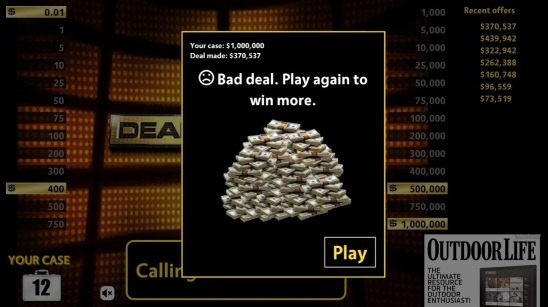 Follows a screenshot of a bad deal within the game app. You might also like these free Windows 8 game apps: Logos Quiz+, Diamond Dash, and Brainteasers. 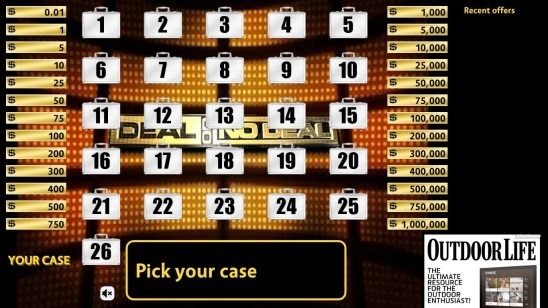 Deal Or No Deal+ is hands down a good Windows 8 Deal Or No Deal game app. To a point, the game depends on your luck but it also depends on your ability to think and make decisions. Don’t be too greedy and always keep an eye on the prize money that is out of the play. Though you won’t get real cash, but still it’s a good game app to get almost the same experience which is felt by the player in real life. Certainly a worth try game app. Also check out these 3 Free Windows 8 Tic Tac Toe Apps. Get Deal Or No Deal+ here.